Cutaway Haunted House Escape info about the game-Games2Rule. 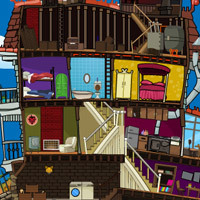 Cutaway Haunted House Escape is a point and click new escape game developed by games2rule.com. In this game you are trapped inside a cutaway haunted house. This house is so far from city. This house is looking so scary and you are alone there, you have heard some scary noises also, at that house. You want to escape from there soon. There is only one way of escape. You want to find the car and garage door key for escape from there. Use your observation skills and solve the mysteries puzzles, find the key and escape from there and go to city. Good luck. Have a fun!